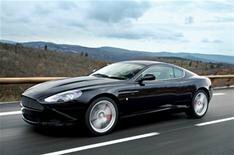 Bond's Aston in real-life drama | What Car? James Bond himself couldn't have done better: an engineer delivering 007's Aston Martin DBS to a film set in Italy has survived crashing off a mountain road into Lake Garda. Fraser Dunn, 29, lost control of the 160,000 supercar on a wet mountain road while on his way to the set of the next Bond movie, Quantum of Solace. He was knocked unconscious as the car sank 45 metres to the bottom of Lake Garda, but came round in time to free himself and swim to safety. Speaking from hospital, Dunn said he felt 'lucky to be alive'. 'The whole thing was a bit James Bond like,' said Dunn. 'I just kicked out of the car and swam to the surface - my lungs felt as if they were going to explode and my chest still hurts now. Dunn, of Leamington Spa, has worked at Aston Martin as an engineer for five years. The DBS was written off, but a replacement is being sent to the film set.